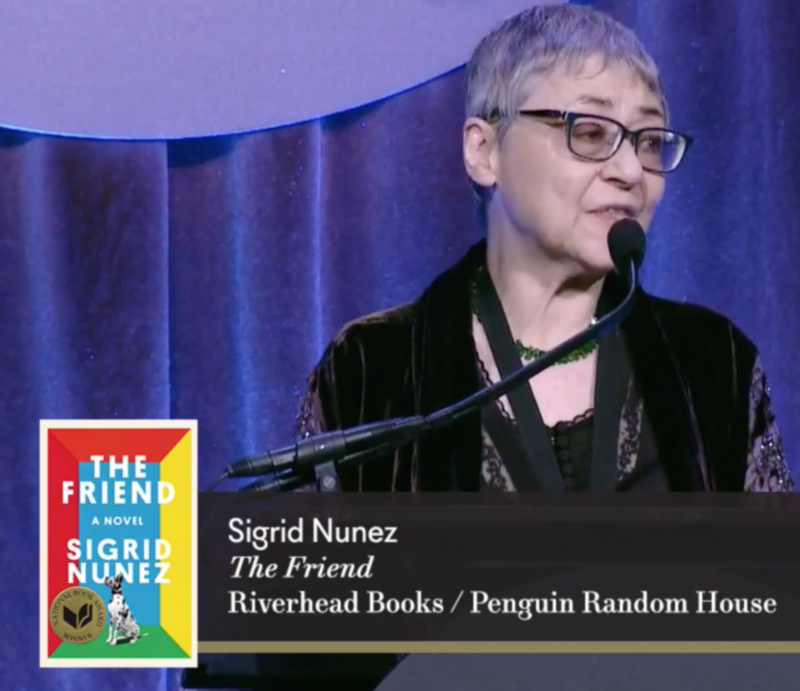 Sigrid Nunez, a longtime faculty member in The New School’s Creative Writing Program, has won the prestigious National Book Award for her novel, The Friend. The novel is a moving story that explores profound loss and celebrates the connection between canines and humans. The plot revolves around an aging writer whose best friend commits suicide and is left to care for the friend’s Great Dane. The National Book Award prize jury called The Friend an “exquisitely written and deeply humane exploration of grief, literature and memory.” The New York Times Book Review wrote that “Nunez’s prose itself comforts us. Her confident and direct style uplifts—the music in her sentences, her deep and varied intelligence. “I thought it was something I could do alone and hidden, in the privacy of my own room,” she said. “How lucky to have discovered that writing books made the miraculous possible: to be removed from the world and to be a part of the world at the same time. And tonight how happy I am to feel like a part of the world. For Nunez, the award is a highlight in a critically acclaimed literary career that has included the Rome Prize in literature, and the Berlin Prize Fellowship. Some of her other work includes the novels Salvation City, and The Last of Her Kind, and Sempre Susan: A Memoir of Susan Sontag published in 2014. Her first novel, Naked Sleeper, was published in 1996. She has also contributed work to a varied array of publications including The New York Times, The New York Times Book Review, The Paris Review, Threepenny Review, Harper’s, and McSweeney’s. Nunez graduated from Barnard College in 1972 and earned her MFA from Columbia University. The night before the announcement of the awards The New School hosted a reading with the finalists in the categories of translated literature, poetry, fiction, nonfiction, and young people’s literature.